Privitisation is, in many ways, one of the defining differences between the left and the right. The right believes that governments are bad at running businesses, and wherever possible business should be left up to business. The left believe that business are pretty good at screwing everyone possible if it means an extra dollar or two. To some extent at least, both are right. That's not meant to be a shameless attempt at fence sitting - my view that governments are pretty bad at running businesses. Almost invariably a business run by government will be less efficient, often because of higher wage costs. Privitisation almost always leads to lower wage bills, usually through a reduction in pay and conditions but often also because of redundancies. A service provided a business will therefore often be a lower quality service. It's little wonder that unions oppose privitisation almost as a reflex. There is a middle ground somewhere - privitisation is not always right any more than it is always wrong. The best known example of privitisation in Australia is Telstra. The Howard government made a packet out of the sale (although not as much as they should have) that was spent on (mostly) tax cuts. 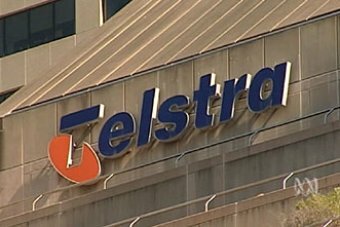 It's not really fair to compare service in telecommunications over different decades, but the prevailing view is that the service provided by Telstra today is of a far lower quality than when it was a government asset. That actually provides a pretty neat seque to the discussion about electricity privitisation debate in NSW, for this reason: the Howard government sold not only the retailer but also the infrastructure - the phone lines themselves. These days Telstra rents that same network to the other telecommunication companies, and is undoubtedly a more valuable company than it would be without that asset. But the kerfuffle about the NBN shows, in part, the dangers of selling off infrastructure like a telephone network. Before the last election Labor practically tore itself apart deciding what to do with the electricity network. In the end, thanks to the Coalition opposing the deal, Labor was not able to secure the sale. Iemma's quote summed up the situation quite neatly: "The leader of the Opposition [O'Farrell] knows that the Government's approach is right. Yet for five minutes of political advantage he has displayed all the principles of an economic vandal." O'Farrell repeatedly said that they would wait for the Tamberlin report, which I have written about here. The GenTrader deal never really made any sense, and in my view it is sensible in principle for the retailers to be sold. Of course the price that can be obtained is a different story entirely, and that will be a question of fact at the appropriate time. No doubt, however, we'll be plagued by a thousand different calculations of the "true value" of the asset and the actual realised amount, such that it will be almost impossible to perceive, through the fog of partisanship, whether the government has actually secured a good deal. The controversial and interesting aspect of the Coalition cabinet's decision, however, is the fact that the decision has been made to keep the "poles and wires" in public hands. This has important implications because the value of the sale is drastically reduced as a result. The poles and wires are far and away most the valuable part of the network, and selling the full network would result in a massive windfall for the government. Nick Greiner has come out and said that the government has "absolutely, totally no alternative" to flogging the poles and wires if it wants to "move the needle" on infrastructure. The Terror has also published this editorial that calls O'Farrell a "fencesitter". The graphic abour really explains the Terror's point of view quite neatly - the assets should be sold so that the money can be spent. O'Farrell has made a lot of expensive promises, and we all know that the money has to come from somewhere. The current political landscape makes it difficult for O'Farrell to borrow large amounts (although it would be interesting to see if the Terror pursued him for borrowing in the same way it has pursued the Federal Government). Further, no one needs to think hard to remember what a sparkling success public-private partnershipshave been in this state. It is not unreasonable to suggest that the poles and wires should be sold so that the money can be spent elsewhere. The discussion then becomes opportunity cost - what is the better use of the government's money? That is the nub of the discussion - by not selling the poles and wires the government is retaining its $20 billion odd investment in the power network. If sold, the retailers would need to pay for access. They will of course need to pay no matter who owns the wires, but at present the cash flows straight to the government. John Robertson is claiming that power prices will rise as a result, and he is probably right. Services provided by government usually increase in price and decrease in quality once sold. 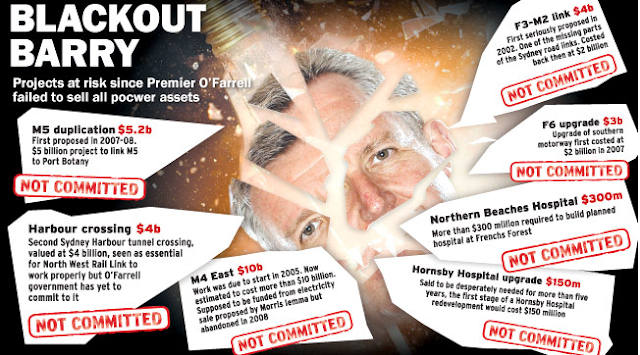 But the Terror has hit on O'Farrell's problem - he has to find the money to pay for his promises. If he wants to avoid borrowing (and presumably he does) then he needs to start selling things. Presumably this is why Mike Baird, Gladys Berejiklian, Greg Pearce, Pru Goward and Andrew Constance all argued for the full sale. I hope for his sake that at that cabinet meeting he explained where he is going to find this money. If he is going to be the Infrastructure Premier we all know he wants to be, he will need cash.